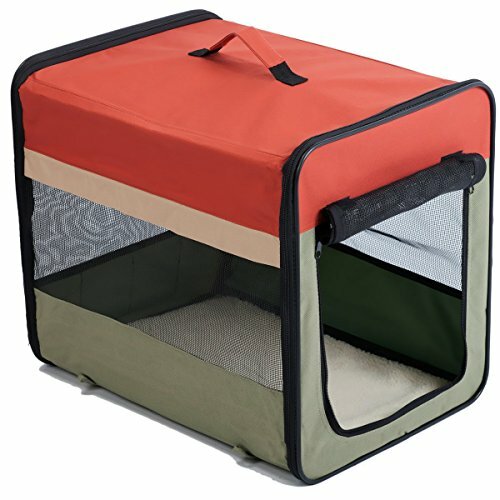 Favorite portable folding crate is perfect for indoor and outdoor use. It sets up and breaks down in just seconds, making it convenient to carry. A sturdy internal steel frame and heavy-duty high quality nylon provide durability and strength. Nevertheless, in order to prolong the service life, strong aggressive animals who are good at chewing or scratching are better to choose plastic or steel crate. By the way, no matter what kinds of cage, do not leave the lovely pet unattended for long time, they really need attention and care. Lightweight, portable and flexible, you'll find sorts of uses for this durable pet tool. From the quality craftsmanship to detail, we all achieve excellence. When pet is in crate and door is half open or more, please lock crate. When your pet is playing with opening crate, do roll the roller blinds up and fix it with fastening strips. We will not responsible for any loss caused by improper use or kennel is used by pet still lacks of training. If you have any questions about this product by Favorite, contact us by completing and submitting the form below. If you are looking for a specif part number, please include it with your message.